So let's throw this out there, what's the relationship between uncertainty and risk kids? Because right now, I am bloody uncertain about a certain part of my life, and really wonder if the risk is worth it? I know, that's so totally mysterious. That's the way I roll. But on a serious note, there is opportunity for me to do something pretty 'risky' which means my immediate future would be pretty uncertain, but the rewards potentially outweigh all the negatives. 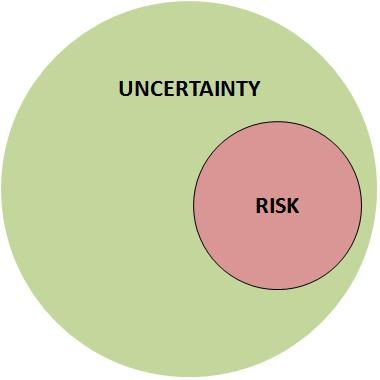 Unfortunately I cannot share anymore at the moment, but what are your thoughts on risk and uncertainty? In other news, I've officially become a British citizen which is super awesome. A queen for a queen I say, and I must apologise for being rather slack with updating this blog. I've been keeping the words (and voices) in my head... overflow imminent! Speaking about this blog - I am somewhat amazed at how few followers I have here. Clearly I am not as interesting as I thought - ha! This is now where you click follow, send to friends to do the same, and thus validate my ego and make me feel even more fabulous.